The WeatherCall system will assign a latitude/longitude to each address. 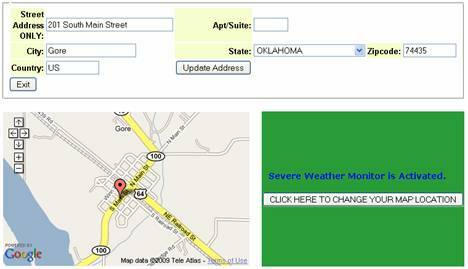 When the National Weather Service in Tulsa issues a warning, WeatherCall compares the latitude/longitude of the warning area with the latitude/longitude coordinates of each record in the Gore database, and will make 3 attempts to call that number and deliver a pre-recorded tornado warning message from Channel 8’s Chief Meteorologist. If there is no answer, the message will be delivered to a voice messaging system if available. Because it uses computerized mapping and compares the precise location of your home with the actual warning area defined by the National Weather Service in Tulsa, the WeatherCall system eliminates false warnings. You only receive a phone call notification if you are actually in the area of threat. Sequoyah and Adair County’s combined 1250 square miles are under a tornado warning. Gore residents would NOT receive a WeatherCall notification because the actual warning area is several miles to the east, and NOT impacting the town. The full-service version of WeatherCall delivers tornado warnings + optional severe thunderstorm calls and flash flood Email and/or SMS text warnings for up to 3 telephone numbers and 3 Email addresses per location; it is available for a small annual fee. Please have a credit card available to complete the payment for your registration. Also, you will need an Email address where your account confirmation information can be sent to you. VISIT KTUL.COM FOR FULL FEATURE WEATHERCALL. NOTE: A WeatherCall will come from phone # 1-866-479-9906. “WeatherCall” so it will display on your caller ID. Copyright © Town of Gore 2019. All Rights Reserved.